While we may not all be ready to follow the Tiny House movement to the fullest just yet, we can all take these small steps in our lives to live more consciously, reevaluate what is important in life, and make what we love a priority. 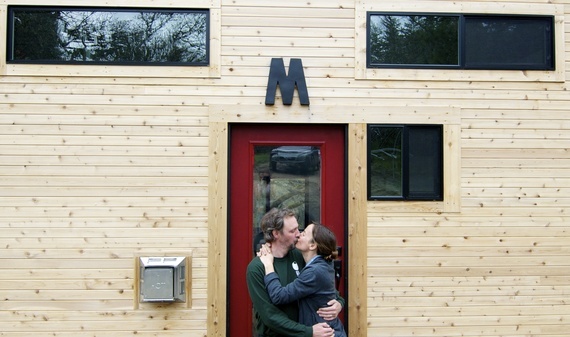 The Tiny House movement is quickly spreading across the United States. Many are trading in their "American dream"-type houses for a more simple, less materialistic life with a significantly smaller carbon footprint. Such people find the idea liberating, freeing themselves from their high mortgage payments, utility bills, cleaning, and general upkeep that comes with "having it all" in your nice, big dream house. On top of this, the Tiny House movement is providing many folks with a new perspective on what's important in life. When we stumbled across the Morrison's story a few weeks ago, we knew we needed to reach out. From selling their belongings and moving to Baja, to building their own Tiny House, to now helping others live this same dream, they were the epitome of Degenerates -- they were turning their passion into a purpose, in more ways than one. We were touched by their story from the very beginning, and we are very grateful that the Morrison's were willing to let us share their journey with all of you. We hope our interview with them will inspire you as much as it did us and allow you to reflect a little more on what's truly important in your life. 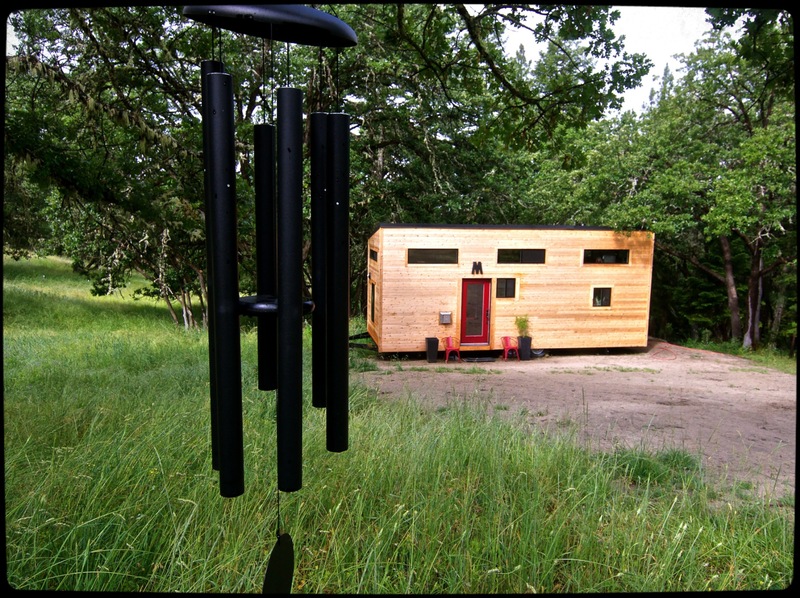 On your site, you talk about longing for the way of life that comes with the Tiny House movement. Before building your Tiny House, how had this longing manifested itself in your life? Discovering the tiny house movement came at a time when we were living in the epitome of an "American Dream" home. Moving into that large, beautiful house was initially symbolic (we thought) of success. We had finally "made it". Trouble was that after about six months, we began to realize that we had become slaves to that house. Our free time disappeared into having to work more to pay for it, to clean it, and to maintain it. We found ourselves saying "No" to our kids much more than we were comfortable with. Our family dynamic suffered and because the house was so large, we all retreated to various corners of the house. In time, all four of us began to ponder if this large, beautiful house was worth it. 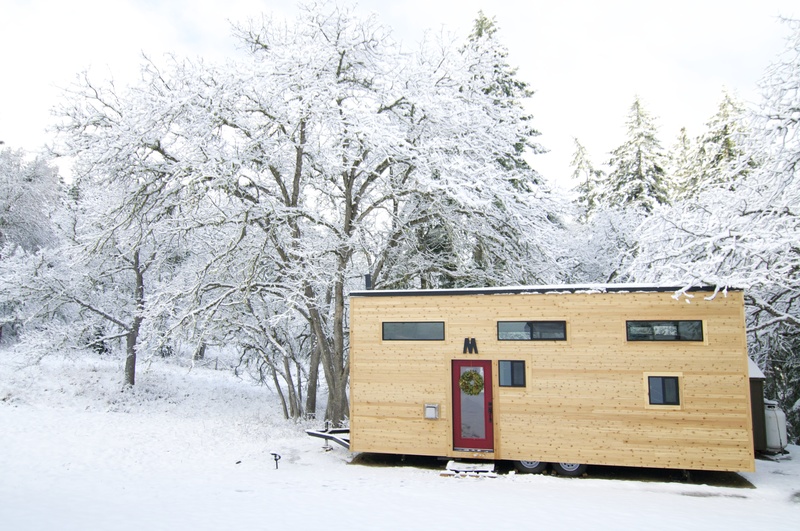 What was the deciding factor that made you believe that building your Tiny House was the right move for you? Did you have an "Aha" moment or was it a more gradual decision? 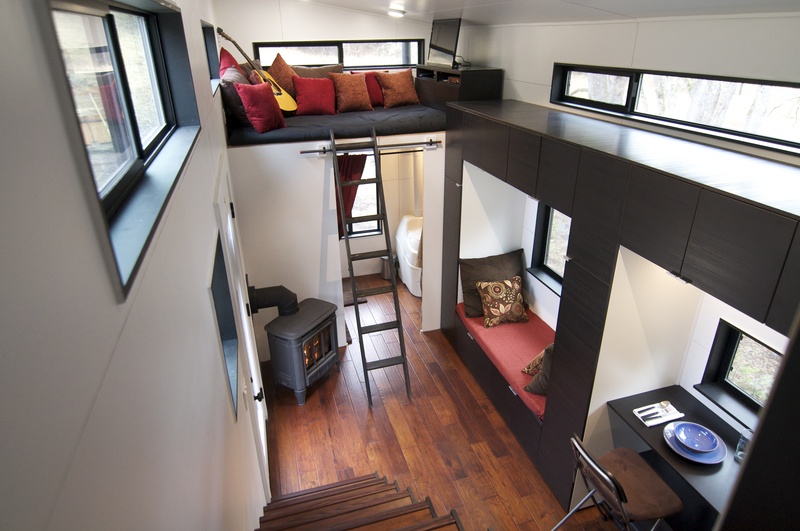 Before we had ever heard of the tiny house movement, we received an inquiry from Kent Griswold of TinyHouseBlog.com. Intrigued by the term "tiny houses," we investigated. When we realized that this entire way of living and inhabiting space existed, our lives were deeply affected. Finally we understood why we had been so unhappy living in that large house. Why our dynamic had suffered. Why we had felt more stressed than ever. We realized that the "American Dream" is a rip off. That day we found Jay Shafer's "The Small House Book" and from that point on, our life changed trajectory. Things moved very quickly from then and within six months we had gotten rid of 90 percent of our worldly possessions, the house, bought a pop up tent trailer, and moved to the beaches of Baja for five months to unplug for a while. We all face challenges in our lives, especially when it comes to making big changes. What were some of the difficulties you faced when deciding to transition to the Tiny House way of life? Did you face any adversity with your family, friends, or others? It's interesting reflecting on this question. Because we have been living tiny for a while now and we (and all those around us) are so accustomed to this fact, it's hard to remember that there was a time in which we faced difficulties. We did though! I would say the overriding "theme" through that time was doubt. We doubted ourselves, our friends doubted us, our family doubted us. It's challenging making a decision as monumental as moving to tiny with so much doubt. Our trip to Baja, Mexico in our pop up tent trailer was our way of "disconnecting" from societal pressures, screen addictions (smart phones, internet, social media, etc. ), and discovering who we were without all of those distractions bombarding us each day. We discovered in those five months that we were happiest with the least. Our family dynamic flourished and we all reached a level of ease and joy that we had not felt since early childhood. From that point on we were crystal clear on what we wanted and needed in our lives. There was no longer any doubt and we put absolutely no weight on any negative comments we occasionally received. What are some of the biggest ways that making this change has affected your life? What are you most thankful for about this experience? I pay a lot of attention to how often I am able to say "Yes" versus "No" in my day to day life. There used to be a lot of "Nos" in our lives. "No" to the kids, to each other, to friends and family. "No" to being able to take spontaneous trips, to watching a movie in the middle of the day, to exercising regularly. What I notice mostly now though is that our lives are mostly filled with "Yeses." It's rare that we need to say "No" to something that we want to do. As a family we spend a lot more time enjoying each other's company. Our pace of life has slowed down significantly and we prioritize rest, excellent nutrition, and exercise. No more wake up alarms or house payments (we paid for our materials in cash). No more utility bills (we are off grid). Breaking away from the Jones' has been the best thing we could have done. You now have a successful business teaching others how to build Tiny Houses and to live simple, more conscious lives. How did you decide to turn your passion into your career? What advice do you have for others trying to do the same? Our nature is to learn and teach and so in nearly everything we do, we see it as an opportunity to grow and share. We have been invested in teaching people how to build their own dreams homes since 2004 and frankly it's the most rewarding work we have ever done. Building shelter is built into our DNA and the sense of joy and satisfaction that people achieve after building their own place is contagious. Honestly though, I feel like if we were able to create a life in which we work from home, call our own shots, and interface with some of the most interesting and amazing people on the planet, then anyone else can do it, too. I would offer this to anyone wanting to create their careers based on their passions: be of service to others, provide a solution to a problem, be authentic and sincere, see the world of opportunity that surrounds you, be positive in your outlook on life, be generous, and most of all, go for something that brings you joy. There are many of us who want to simplify our lives, declutter, and live more consciously. However, not all of us may be ready to take the plunge to build and live in a Tiny House. Do you have any tips for how people can incorporate this way of life if they are still living in a city or an apartment, for example? This is the best question! Living what we would call the "tiny lifestyle" can begin today for anyone, irrespective of what size house they live in. It is so much beyond just living in a very small footprint but really about creating a life that supports joy, health, and environmental stewardship. If someone is feeling frustrated by the amount of money, time and energy is being wasted on things they don't need, we want to recommend a very simple, yet profound, exercise we call the "365 Day Rule". Start at one corner of your dwelling, go through every single belonging, and ask yourself, "Have I used this item in the last year?" If the answer is no, put it in a pile of things to get rid of. No ifs, ands, or buts about it. The key is that you must go through every single item and pull everything out of all nooks, crannies, and drawers. It's unbelievable how much junk resides in hidden places. Without giving away too much about the potential emotional process in this exercise, I do want to share that one will discover more about what their relationship is to materials goods than anything else by doing it. Also, one recurring theme when people complete this exercise (which can take days/weeks by the way) is a sense of emotional lightening. There is a weight to material possessions that most of us don't recognize until it begins to ease up. Once completing the 365 exercise, profound changes can happen and part of the fun of it is for people to have their own discovery with it. Inspired yet? We sure were. While we may not all be ready to follow the Tiny House movement to the fullest just yet, we can all take these small steps in our lives to live more consciously, reevaluate what is important in life, and make what we love a priority. The opportunity for significant change is available each and every single day. Seize the day and make the changes you want starting now!